The days before Dreamworld and Movie World became must-sees may have long receded into the past, but the current attractions were far from the first to be built in Queensland’s playground. Some were dangerous and outrageous, reminders of a time before stringent safety regulations and an escaped elephant could possibly be seen wandering through the suburbs of Beenleigh, and all now only exist in legend. Magic Mountain was the first, built in 1962 at Nobby Beach, right next to Miami High School. It started life as simply an outcrop with a chairlift that carried people to a cafeteria at the top of the headland — a bold construction for the early days of the Coast, but quickly paying off when it had 40,000 visitors in its first year. Tourism boomed, the park changed owners, and a Magic Castle was built in 1976 which saw attendance only dramatically increase. Attractions were then added until the site had 10 rides at its 70s and 80s peak. There were the classics, like dodgem cars and two carousels (including a double decker! ); and the more unconventional, like the Parachute Drop Tower, a precursor to Dreamworld’s famed Giant Drop, and a ball pit. Countless memories were made at Magic Mountain, largely without notable incident or controversy, although, safety standards for some of its most popular features would undoubtedly be different now, including the Giant Cargo Nets. It wasn’t until the popularity of Dreamworld and other competitors came on the scene that Magica Mountain closed its gates in 1987. 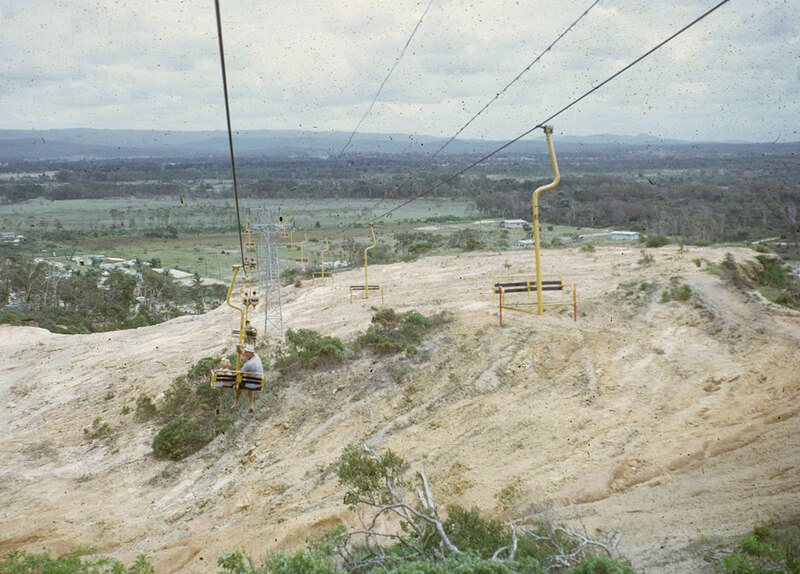 The famed chairlift were even moved to the park’s competition in 1989, as it became derelict before being cleared in 1991. 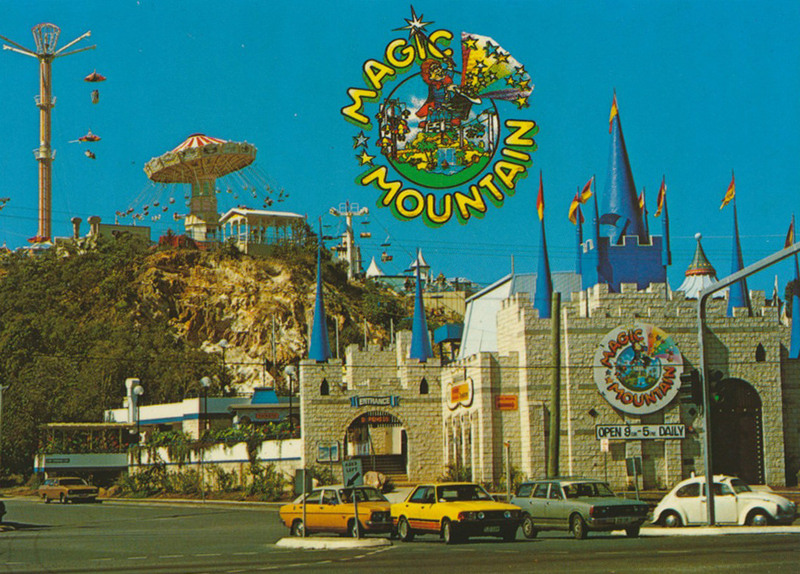 Now, its legacy only remains in a resort with the park as its namesake — Magic Mountain Resort. 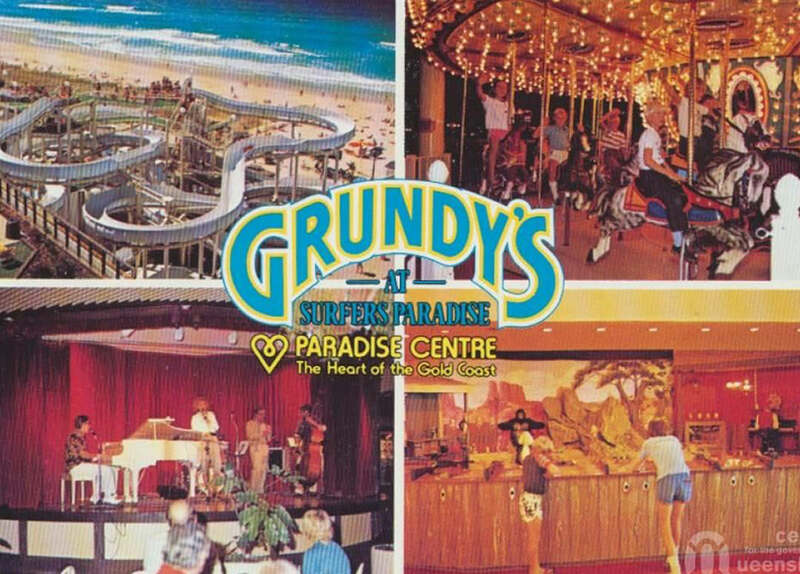 Things were not as uncontroversial for Grundy’s, a Surfers Paradise beachfront park that opened in 1981 and entertained visitors for 13 years. 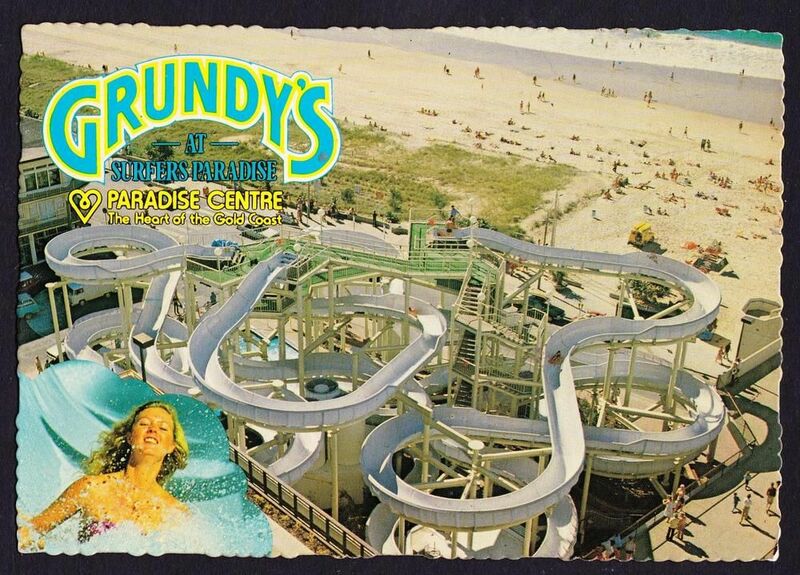 Grundy’s boasted four famous waterslides that twisted intricately across each other, as well as the mainstays; dodgems, mini golf, a carousel, an alligator themed roller coaster, and one of the first video game arcades on the Coast. The park even featured a Hollywood Walk of Game-style of attraction to celebrate Australian stars, and as such, it attracted some pop culture celebrity, playing an important part in the fun-loving music video for the 1981 Australian Crawl hit, Errol. 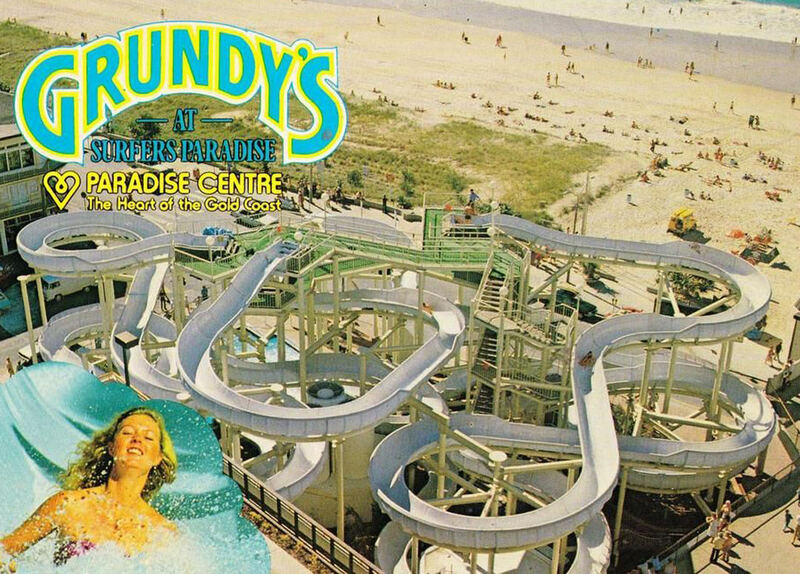 But controversy struck in the mid-80s for Grundy’s, when razor blades were allegedly placed between joints on the popular waterslides, injuring a child and drawing concerns about safety. 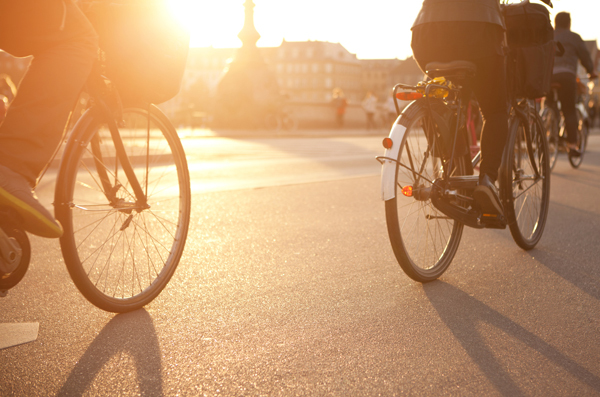 Those claims intensified again in December 1985, when a rider fell from a slide while trying to stand up on a ‘fast mat’ during their ride. Both would’ve likely resulted in extensive personal injury claims against the park if occuring today, but instead just acted as a symbol of the park’s slow decline. The once-beloved waterslides were removed in the early 1990s, before the entire park closed in 1993. Popular arcade Timezone then took over the site as well as several of the games, and the former site of the slides were converted to retail space. By the 2010s, the only sign of the popular park’s former existence was the remains of its mini golf course atop a building. 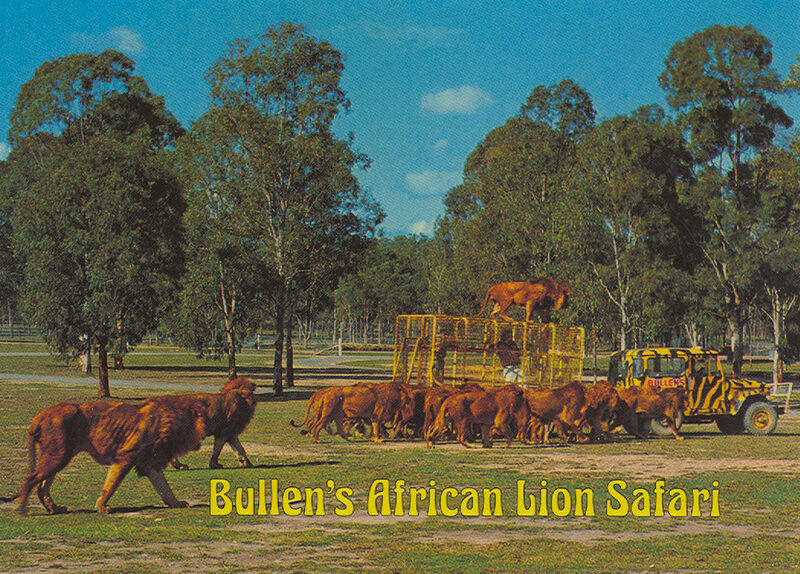 But perhaps much more bizarre than anything else, is the once-existence of Bullens African Lion Safari Park at Yatala, which created a makeshift African savannah on the outskirts of the suburbs. Surprisingly, it was open from 1969 to 1988. 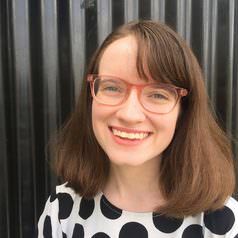 A profile of the opening day from The Courier Mail describes the park’s opening day as something otherworldly, where 60s-era Holdens and Fords crept through bushland, surrounded by camels, elephants, water buffalo, tigers, hyenas, and lions wandering freely. Photographs show staff cuddling with lions, as well as riding on their backs, dangling food from open windows of cars, animals climbing on top of car bonnets, and elephants performing on streets in front of thousands. Staff would walk inside a cage as they fed animals. “The traffic was bumper to bumper,” it says. “It paid to heed the park's entry sign, which read: ‘Keep windows up’. 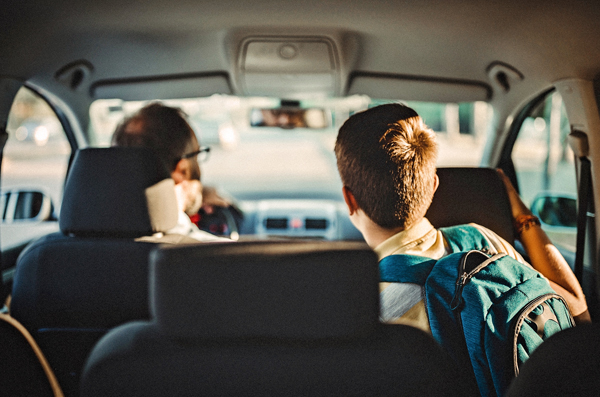 The only problem was, in those largely pre-airconditioning days, a summertime visit meant the family was bathed in sweat by the end of the visit.” Unsurprisingly, it wasn’t long until the park’s relaxed nature caught up with it. 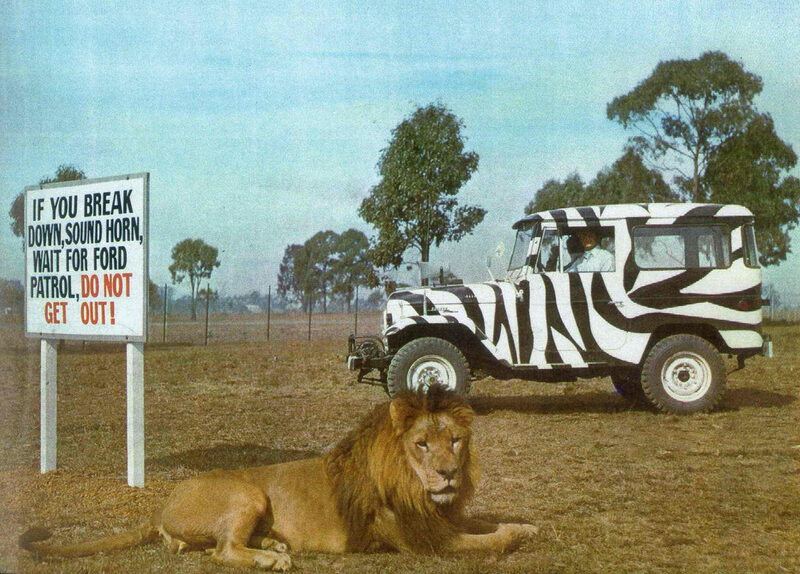 Amongst numerous accidents and deaths, in 1973, a staff member of the park was dragged away by lions and killed in front of a family sitting in their car. Striking workers also claimed they had been bitten by hyenas and clawed by tigers, with management locking them out after demanding a raise for the risk. The park only got more bizarre in the coming years, with Jumbo the Indian elephant escaping to rummage through bins in suburban Beenleigh during the dead of night on one occasion. There was even a legend that Jumbo once chased a lion out of the park, which never returned and roamed free in the surrounding area. In 2015, a local resident even claimed that they saw a female lion in their headlights while driving one night. Food concerns intensified in 1985, when a newspaper ad had a curious request. “Free livestock removal service. Sick or injured cows and horses removed promptly, free of charge. Phone Bullens Lion Park,” it said. Costs and controversies remained high, with animals eventually auctioned off before the park closed down in 1988. With former visitors creating Facebook pages to reminisce (and in the case of Grundy’s, argue that the park should be revived) about their former childhood holiday hotspots, the weird and wacky Magic Mountain, Grundy’s, and Bullens now live on in family photographs and hazy memories of sunburnt days and long car rides. They’re relics of another time that is relatively recent but alien, where lions were left relatively free in suburbs now filled with houses, a Magic Castle sat atop Nobby’s Beach, and water slides wound around Surfers Paradise.